Before I get into the recipe, I have to give a quick apology to one of my followers, Kevin V. I made this dish well over a month ago and posted it on Instagram… He requested the recipe and I just didn’t have the time to get it done. Sorry man, hopefully it’s better late than never. Also, my apologies for the picture quality… I didn’t anticipate posting a recipe for this dish so I only took a shot with my phone for Instagram, lol. 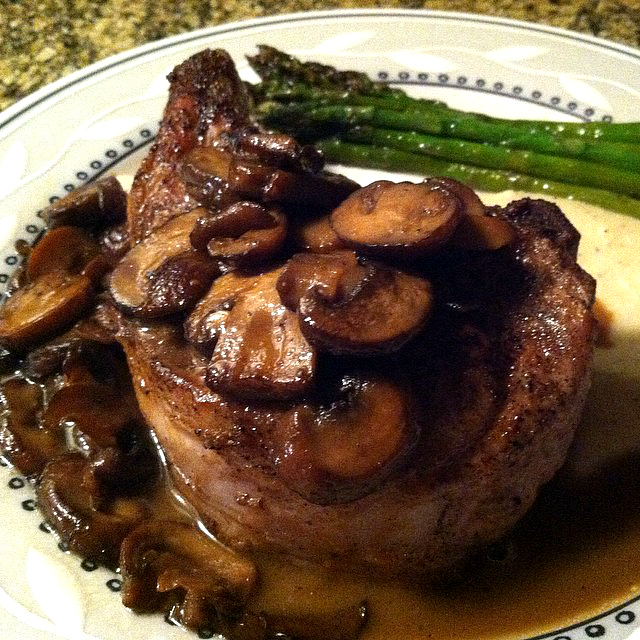 So the dish is a seared pork chop over a cauliflower & potato puree, accompanied by sautéed asparagus, finished with a mushroom & Madeira sauce. One quick note… I’m giving directions for how to prepare each individual segment of the dish separately. As you can see certain aspects of the dish take longer than others, so you can’t start everything all at once. Look at the timing of each item and plan accordingly. I am, though, listing them in the order that they should be started. Combine the seasonings listed in the “pork” section and liberally rub your chops. Heat the olive oil in a large sauté pan at high heat. Once hot place the seasoned chops in the oil and sear until lightly browned, then turn and repeat, 2-3 minutes per side. Remove the chops from heat and allow them to rest at room temperature for 15 minutes. After resting the chops put them in the preheated oven and cook for an additional 10-15 minutes, depending if you prefer a slightly pink center or cooked all the way through. I recommend medium (slightly pink)… this isn’t the 1950’s, nobody is getting Salmonella from pork anymore! Remove from the oven and rest for another 5 minutes before serving. This allows the natural juices within the pork to once again absorb into the meat. If you serve and cut them as soon as they’re finished cooking all of the juices will drain out. Place your cauliflower, diced potato and seasoning from the “puree” section in a large pot with the heavy cream and chicken stock. Bring to a boil for three minutes, then reduce the heat to low and simmer uncovered for 20-25 minutes (until the cauliflower is soft). Using an immersion blender, food processor or regular blender, puree the cauliflower & potato mixture, then stir in the butter and grated parmesan. Cover until ready to serve. Lastly, the asparagus. You can save these until the pork is resting out of the oven, as they only take 3-5 minutes, depending on thickness. Melt the butter in a large sauté pan at medium-high heat and add the asparagus and chopped garlic. Sauté for about 1 minute then add the chicken stock, lemon juice, salt and pepper, simmer for 2-4 minutes until slightly soft. Once everything is done it’s time to plate up. Personally I put down a layer of the puree, the pork over that and the asparagus to the side, then ladled the sauce over the pork… Seems to make the most sense. So there you have it, my recipe and my wine recommendations. Once again Kevin, I’m very sorry for the delay! As always new content is on the horizon… In the meantime crack open a bottle of something awesome, sit back, and relax. Life is short, enjoy it! Tags: asparagus, cauliflower, cauliflower puree, madeira, mushrooms, perfect pairings, perfect pairings at home, seared pork, wine, wine pairings. Bookmark the permalink.